Coming from a family of restaurateurs, Valter Bovetti was immersed in the culinary arts from a very young age, in particular spending whole Sundays helping out in the family establishment ‘da Cesare’ (named after his father Cesar). In 1985 at the age of 27, he left Italy and his native Piedmont to settle in France. 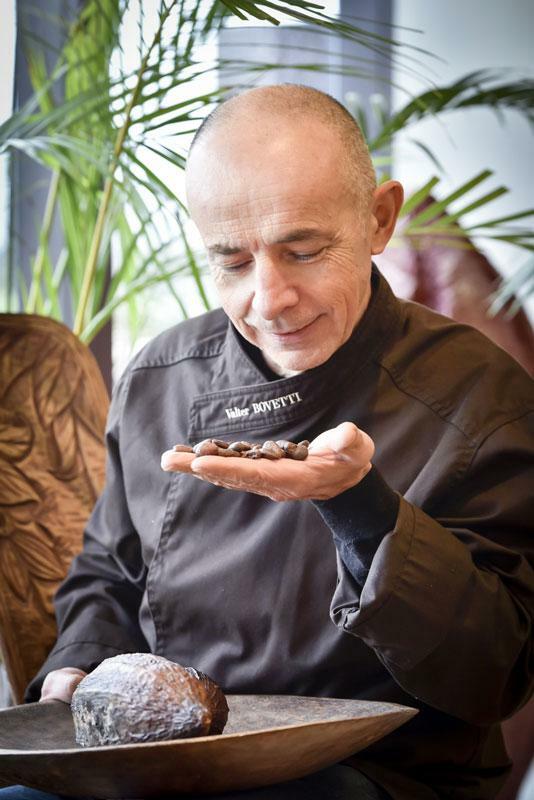 In 1994, he finally achieved his dream of opening a chocolaterie in Aubazine, Corrèze. In 2002, the large-scale Bovetti chocolate factory opened in Terrasson in the Dordogne with a workshop, shop and even museum all on a single site. Wishing to strengthen his passion for quality and to make respect for the environment part of the work of the producers supplying him, in 2008 Valter Bovetti created his own certified organic ‘Fairtrade’ range. This range is made entirely using exceptional grand cru chocolate from Santo Domingo. This certified Fairtrade approach ensures that planters receive a decent income. Valter Bovetti has opted for organic principles as a way of bringing his professional conscience in line with his personal convictions for sustainable, healthier agriculture. In order to ensure the best possible raw materials, Valter Bovetti regularly visits his partner plantations where he can carefully select the very best cocoa beans himself. He is personally committed to verifying the processing methods used in producing countries and to continually improving his understanding of planters’ lives.